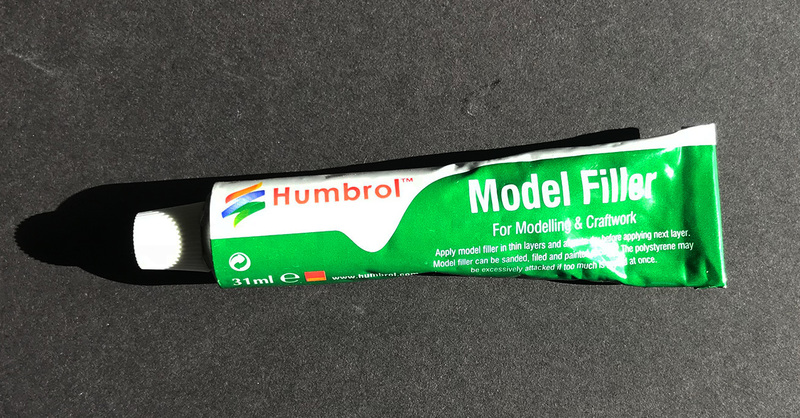 This is all about using putty for plastic models. 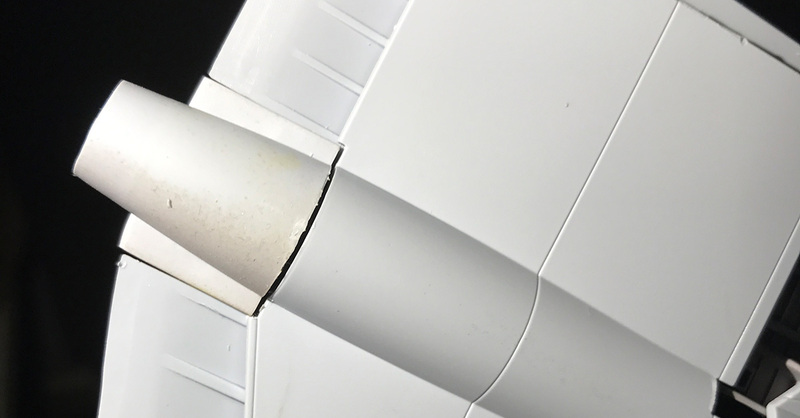 Often enough there is a joint that won't fit or a conversion that need a bit of remodelling. 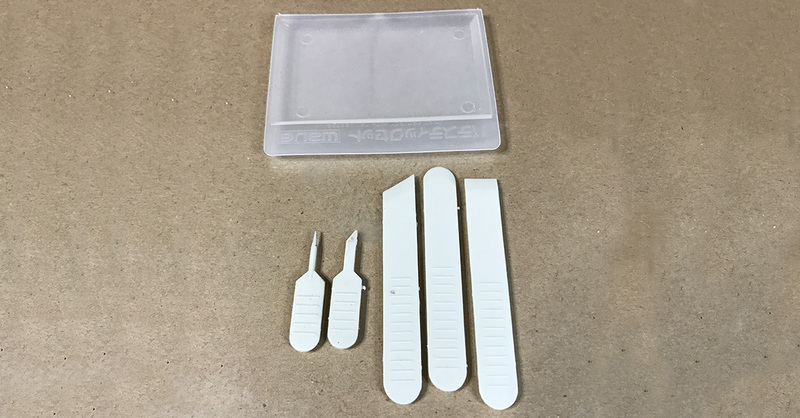 Even a plastic model kit with perfect fits can benefit from some extra work on the joints. Here is a subject that one could spend a lot of time on. I'll try to keep it simple. 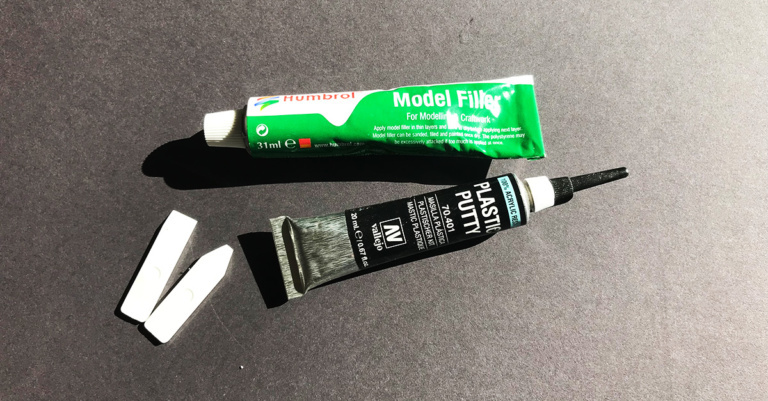 There is a lot of different putty for plastic models you could use. My father used Plastic Padding which I find a bit brutal. It gets very hard and takes for ever to grind down. Today there's a large supply of different special putties from different brands for different purposes. I use two kinds of putty. One is fairly standard modelling putty, in my case either from Tamyia or Humbrol. These are good for filling large gaps or building up things where needed. When using these it's a good idea to let them harden properly after application. Sometimes it's tempting to have a go at it when it feels hard on the surface just to find out that it's still soft at the core and it falls apart. Let it rest for a day to be on the safe side. When it has hardened it's fairly easy to form with a file or sandpaper. 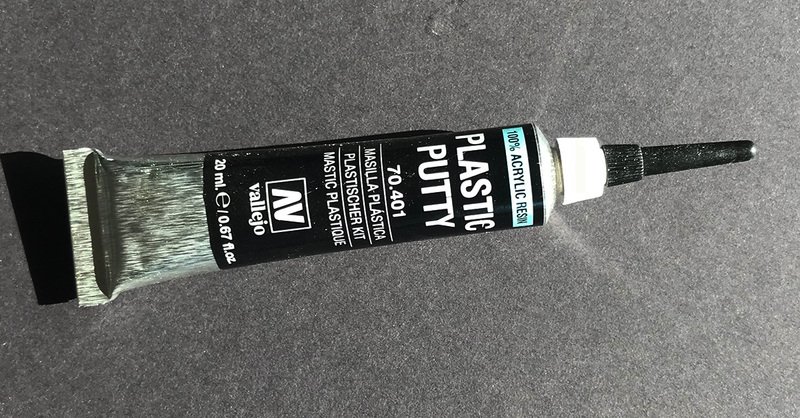 The other stuff I use is Vallejo's Plastic Putty which is a little more runnier than standard and also comes with a pipe for applying it in small strings. It's perfect for filling small gaps in joints etc. as it easily seep down into the gaps. You can use it as normal putty too if you like. You can work putty with a lot of different tools but I've found these to be invaluable; a tray to hold the putty from the tube and a set of different shaped trowels. The ones I've got is made of soft and flexible plastics which makes them very easy to clean after use. When building plastic models you will soon find that all parts doesn't always fit well together. There will be gaps in the joints and these can ruin the over all look when you've spent hours cementing and painting. So fix them. Larger gaps are best filled with the afore mentioned modelling putty. Fill the gap and then some, it's always better to put on some excess putty and then grind it down with a file or sandpaper than to put on to little and having to add more later. But try to keep it close to the area that needs to be fixed, it's not fun to ruin perfect surfaces unnecessarily. While applying the putty make sure that it penetrates the gaps properly and work out any air bubbles from the putty. When you're done putting the putty in place leave the kit alone for a day or two so the putty hardens properly. When starting to work on the often uneven surface of the hardened putty be sure to use a file or a sandpaper block to get the even surface. Work the area with sandpaper of finer and finer grain until the surface is smooth. If you want to be really sure that the end result holds up then paint a layer of surface primer on the area, this really highlights the imperfections. Keep on doing this until you are satisfied. When you're done there is just one thing left to do to get a really good end result and that is to replace the panel lines and rivet holes you've covered or filed away. This is carefully done with a dull needle. To get straight lines it helps to put a little thicker tape along the wanted lines and drag the needle along the edge. When it comes to smaller gaps where there should be a panel line anyway then the afore mentioned Perfect Plastic Putty comes in handy. As it's thinner than ordinary putty it seeps down the gaps nicely. 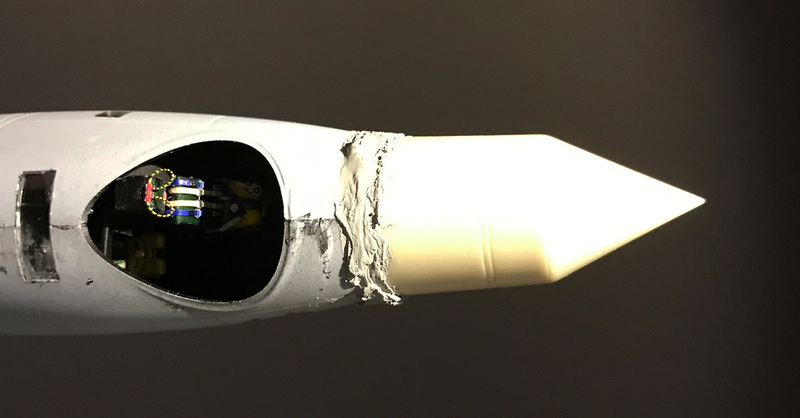 Apply a string along the gap and carefully remove the excess putty with a damp cloth. 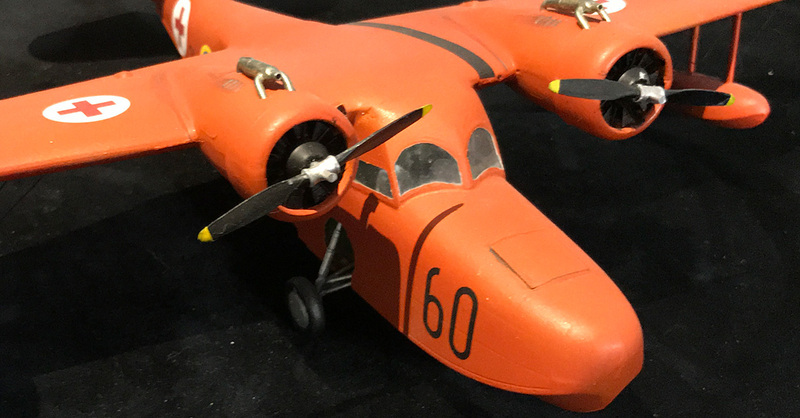 Sometimes when a plastic model is really out of shape or if you want to do some conversion (like building a version that looks different than the one supplied in the kit) then you might need to build up some structure with putty. Like the example on the left where the canopy of a Gumman Goose was too short and lacked several mm on top up to the other parts. 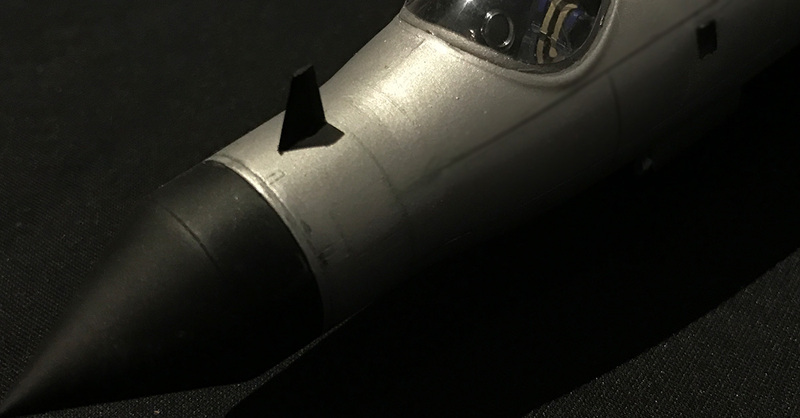 Another example is the Canberra above where I got an after market nose cone to make a version used by the Swedish Air Force. 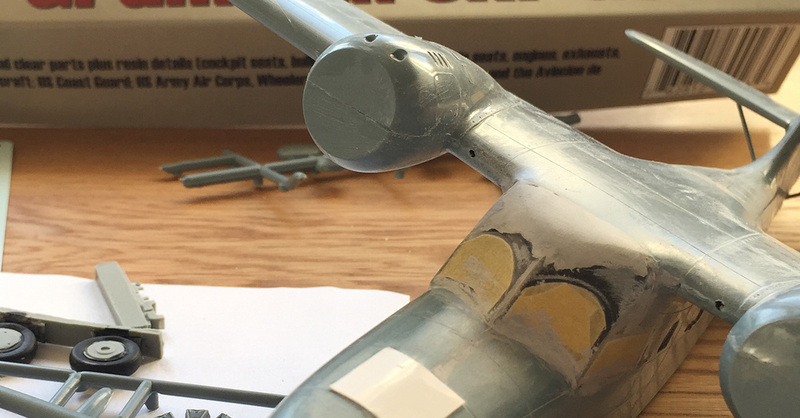 Cutting away the original nose from the fuselage and fitting the new nose cone left a lot of gaps etc. So adding a generous amount of putty I could file and sand it down to an even surface.